For a budget set, these cymbals look great and are pleasingly musical. The hi-hats and crash perform beyond their humble price point and would suit a variety of styles, while the ride is more geared to louder genres. Founded over 30 years ago by master cymbal-smith Agop Tomurcuk, Istanbul Agop has built its reputation on hand-crafted instruments. The new ART series of cymbals has been designed to make an affordable entry point to a company immersed in cymbal history. 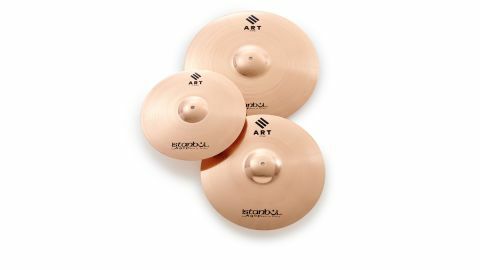 Currently, Istanbul Agop’s ART cymbals are only available as the three-pack on review, which comprises a pair of 14" hi-hats, a 16" crash and 20" ride and includes a branded cymbal bag. At this price-point the usual Agop traits of individual casting and hand-hammering are not to be found; instead the ART cymbals are cut from sheets of B8 bronze and pressed into shape. Lathing - found only on the top of each cymbal - is done by hand while the highly-polished finish adds a professional look. The hi-hats and crash are medium weight while the 20" is a little more meaty. B8 cymbals tend to be more direct and less complex-sounding than B20 counterparts and from the first stroke the hi-hats elicit a clean, focused response. Beneath the attack lies a broader note, so while stick-tip 16th notes are expressed crisply, digging in with more of the stick shoulder adds depth and bite to eighth-note patterns. Loosening off the pedal brings a sloshy wash to the fore. At maximum velocity the high frequencies begin to dominate, but overall this is a pair of well-balanced and versatile hi-hats. Moving onto the 16" crash brings similar observations; it opens quickly with a bright note, revealing warmth in the smooth decay that follows. We found it difficult to find any fault - it’s as harmonious and well behaved a crash as you could hope for and it’s a shame that there is no 18" model (at least at the moment) to complement it. The 20" ride’s overriding characteristic is toppiness, aided as much by its heavier weight as the brilliant finish. A glassy stick sound is chivvied along further by an enthusiastic - and occasionally insistent - cushion of wash. While not being the most subtle of ride cymbals it does project well. This is especially true of the bell, which gives a deep metallic peal completely separated from the main body.